Congratulations to all our students, parents and staff for achieving a Progress 8 improvement of 0.09 since last year. This equates to around 90 grades going up from our previous year. We are also very proud to announce that 8 students achieved the top mark, a grade 9. One student achieved two grades 9 and another student achieved a grade 8 or above in six different subjects. Outstanding. 8 students achieved a grade 9. 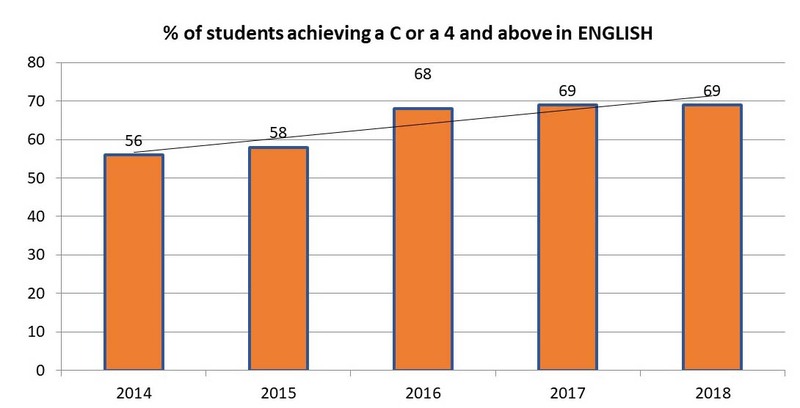 Our attainment 8 has improved to 39.46 since the introduction of the more challenging 9-1 GCSEs. This shows a improvement of nearly have a grade per student on average. Our Progress 8 has improved by 0.09. It has significantly improved for some subgroups and baskets. Third consecutive year with strong English Results. Sustained excellent progress. Our English and Maths results continue to be strong. 73% of our students achieved at least a grade 4 in English Literature. Great results in a range of subjects. Outstanding result in Chemistry. The Value Added in Languages is 0.20, which means that our students are working above national. We entered our students to a range of languages: Spanish, Arabic, Italian, Polish and Urdu. One A* was achieved in Italian. One A grade was achieved in Urdu and Polish. In Spanish, three students achieved a grade 9, two students achieved a grade 8 and 4 students achieved a grade 7. The results in RE were outstanding. 3 students achieved a grade 9. 7 students achieved a grade 8. 23 students achieved a grade 7.